Driving through the lush Irish countryside, I was struck by the simplicity and energy of the stone walls. There is an earthy contrast between the rough-hewn gray stones, the deep green of the pastures and the white wooled grazing sheep. 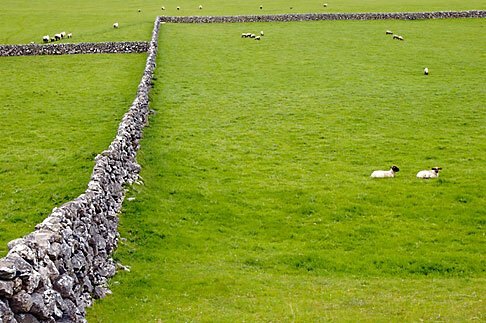 The walls enclose the land, define boundaries between neighbors, and protect the sheep from wandering off. Climbing carefully on a wall on the narrow verge of a country lane, I composed the image to crop closely, eliminating the sky and letting the walls partition the image into geometric segments. The single wall leads the eye into the distance, while the two sheep lying in the field counterbalance and keep the viewer in the picture. Your photography is beautiful and thank you for sharing. I’m not sure how I got to this site but don’t want to leave. I will return.